The ModelData_Model class encapsulates a data structure which eventually contains entire information on the 3D model. ModelData_Model contains a product structure, or a hierarchy of elements, often called a scene graph. Product structure is provided via a graph that describes hierarchical relationship between the elements. Part is a leaf node in a graph, corresponding to a mechanical part or a product. A part is something logically undivisible and often consists of a single body (e.g. solid body). Assembly is a group which contains zero, one or more graph elements, including nested sub-assemblies. Instance Instance is a particular occurence of (or a reference to) another element (part or assembly). Allows to share elements and associate individual attributes (e.g. colors) and transformation matrices. Below is an example of an assembly named "as1" (STEP file can be downloaded from here) and its graph. Assemblies are shown with the folder icon (e.g. 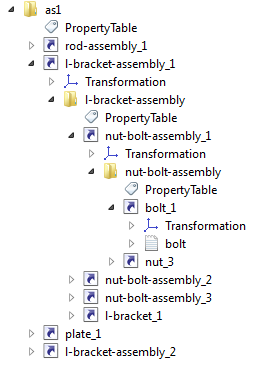 l-bracket-assembly), instances - with the arrow icons (e.g. nut-bolt-assembly_1), parts - with the sheet-like icons (e.g. bolt). This example will be referred to when explaining concepts of the data model. Part (ModelData_Part) is a leaf node in a graph, corresponding to a mechanical part. A part is something logically undivisible (in the context of application). A part refers to representations (see Part representations) which define geometrical shape of the part. Depending on an input format the part may have precise geometrical representation (B-Rep) and/or an approximated polygonal one. Assembly (ModelData_Assembly) is a group which contains zero, one or more graph elements, including nested sub-assemblies. 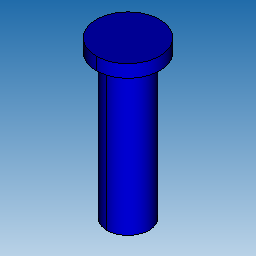 The following picture demonstrates the nut-bolt-assembly from the assembly as1. 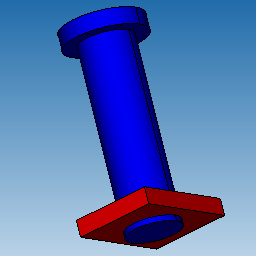 The nut-bolt-assembly includes two parts - bolt and nut. Assembly may refer to associated properties. Instance (ModelData_Instance) is a particular occurence of some element (part or assembly). Instances allow to share elements and to associate individual attributes (e.g. colors) and transformation matrices. 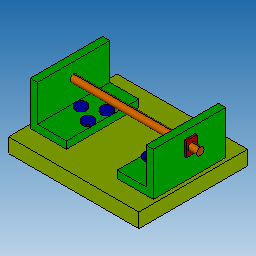 The following picture demonstrates the l-bracket-assembly, which includes a single l-bracket part (in green) and three instances of the nut-bolt-assembly, each with different transformation matrix. 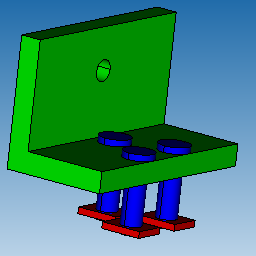 Parts and (sub-)assemblies may be shared between assemblies. For instance, in the example above, the "nut-bolt-assembly" is used three times by the "l-bracket-assembly". Instances shall always be unique and shall never be shared. with the help of visitors. Iterators support a Java-style interface. The graph implements the visitor pattern, and even more specifically the hierarchical visitor pattern. Each graph element (part, assembly, instance) accepts a visitor which must be a subclass of an abstract class ModelData_Model::ElementVisitor with redefined methods to visit respective element type. The element invokes respective visitor's methods and (recursively) sends the visitor to nested elements. This mechanism ensures visiting of entire graph or a sub-tree starting with some particular element. If the redefined VisitEnter() method returns false then the respective assembly or instance will not be visited, i.e. assembly's children or instance's referred element will be skipped. ModelData_SceneGraphElementUniqueVisitor which allows to visit only unique elements (e.g. in the assembly as1 each nut and bolt will be visited only once). A graph may have zero, one or more root elements. Roots may be parts and assemblies only. Instances may not be roots. Assembly's children are always instances, so an instance shall be created to refer to a part or a nested sub-assembly. A part may have zero or one B-Rep representation and/or zero, one or more polygonal representation. Bodies of B-Rep representation (inside the same part or between the parts) may not share subshapes. Each subshape must have a single parent body.